London: For Henry Colburn, 1825. Octavo. In two volumes, 524pp. and 515pp., half-titles present along with two hand colored frontispieces and two large folding maps of Colombia (sic). Captain Cochrane decided to take a two years leave of the Royal Navy and travel various parts of the world. He began his journey to the West Indies, but his main reason for traveling to Colombia was to secure a commercial privilege for the improvement of its pearl-fisheries. He also wanted to learn more about the country, its people, government and more though he had not forseen the many circumstances that would happen during his travels. Boun in full green polished calf, boards trimmed in a decorative gilt design, raised bands with two brown mrocco spine labels gilt, other compartments fully gilt decorated, marbled endpapes, all edges marbled, joints lightly rubbed. internally clean and bright. A very nice set. HUME, David, & Tobias Smollett. London: G. Cowie and Co. and 25 others,, 1825. From the Invasion of Julius Caesar to the revolution in 1688; by David Hume, esq. Continued to the death of George the Second by T. Smollett, M.D. A new edition, with portraits and lives of the authors. 13 volumes, octavo (215 x 136 mm). Contemporary calf, spines gilt to compartments with dark brown labels, ornate blind-stamped lozenges to covers within wide roll-tooled blind borders and triple gilt fillets, marbled endpapers and edges. Portrait frontispiece with tissue guard to vols. I and IX. Marking and light wear to some covers, occasional foxing and creasing to pages. Overall an excellent set. 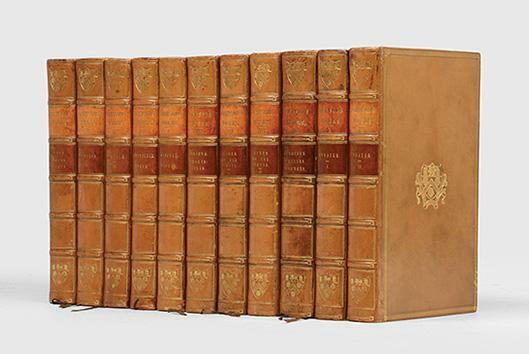 A handsomely bound set of Hume's famous history, first published in 1754-61 and continued by Smollett after his death. "Hume triumphantly [demonstrated] that it was possible to write such history in a manner which combined good historical argument with good writing, and thereby appealed to an extensive readership" (ODNB). Der Führer durch Weimar und dessen Umgebungen. Zum Nutzen der anwesenden Fremden und zur angenehmen Rückerinnerung für alle die, welche einst hier waren. Mit drei Kupfern. London, 1825. 5 3/4 x 9 1/4. Frontis, title, xvi, (8), 939, (27) pages plus 28 plates, one double page, 4 folding and numerous text illustrations; 4 leaves of advertising misbound in the appendices. Recent cloth backed boards. edges marbled. Scattered pencil comments, a few pages with small stains in the margin; generally clean and crisp. Overall very good condition. A comprehensive manual with a nice section on presses. Hansard acknowledges his debt to Stower's 'Printer's Grammar' but much of the material is new with the proliferation of the iron handpress, proliferation of stereotype printing, and the advent of lithography. PBS Journal No. 4; List of Printer's Manuals E13. Bigmore & Wyman I p. 301. Australia: R. Howe, Government Printer, 1825. Fine copy in restored original binding.. Small quarto, with a folding table, some light browning; a fine copy, complete with the errata leaf, in contemporary polished half-calf over marbled boards, bumped, sympathetically rebacked, with most of the original spine laid down, lettered and decorated in gilt. Fine copy of the iconic work on Australian wine, in the preferred "quarto" format. Only very rarely seen on the market: this is the first book on Australian wine, the first book on wine to be published in Australia and the first book to carry the imprint "Australia" on the title page. This copy corresponds with the special issue in quarto format on thicker paper identified by the bibliographer Ferguson - though it has been convincingly argued that the difference between copies is not so much a question of issue as of the particular materials, especially paper, available to the publisher at the time. By 1825 the publishing industry in Sydney was mature but still slight of build, and certainly still subject to the vagaries of supply.James Busby, the father of Australian viticulture, was born in Scotland in 1801; he emigrated to New South Wales in 1824 after visiting the Bordeaux region of France where he studied methods of viticulture. He published his Treatise very shortly after his arrival in the colony. Five years later he published his Manual of Plain Directions that was aimed at small settlers whom he hoped would be able to "enjoy their daily bottle of wine, the produce of their own farms". 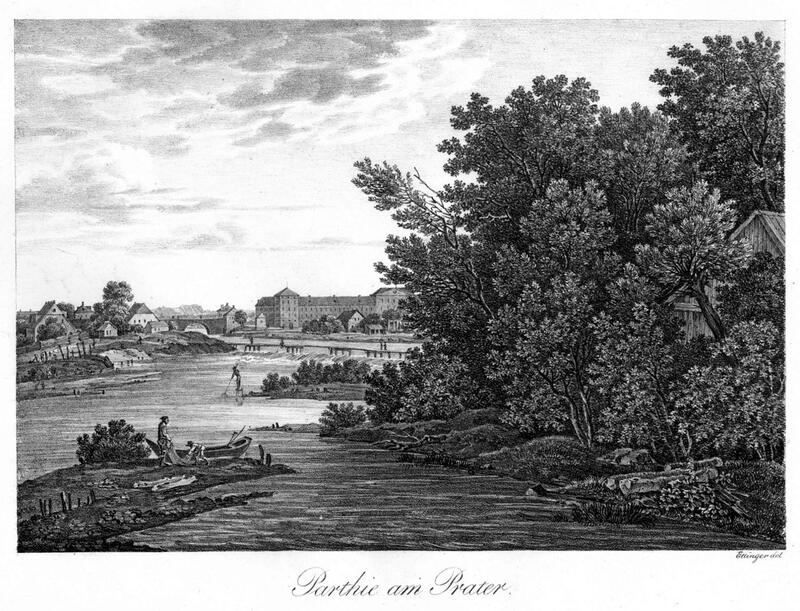 Busby received a grant on the upper Hunter River, which he named "Kirkton", shortly after the publication of the Treatise and planted it with European vines. This famous vineyard was taken over by Lindemans in 1914.A very attractive copy of this foundation book, which marks the very beginnings of the Australian wine industry. Provenance: Private collection (Australia). MÜNCHEN. - Prater. "Parthie am Prater." Blick auf den nördlichen Teil der Praterinsel mit der vorgelagerten Feuerwerksinsel über das Überfallwehr zur Kalkinsel, dahinter ein Teil der Ludwigsbrücke und die Schwere-Reiter-Kaserne (heute Patentamt), in der Ferne die Zugspitze, vorne Isarfischer bei der Arbeit. - Lithographie von J.C. Ettinger, um 1825, 20,5 x 29,5 cm. Maillinger I, 1817, 1; Slg. Proebst 560; nicht bei Lentner. - Schönes Exemplar mit breitem Rand. 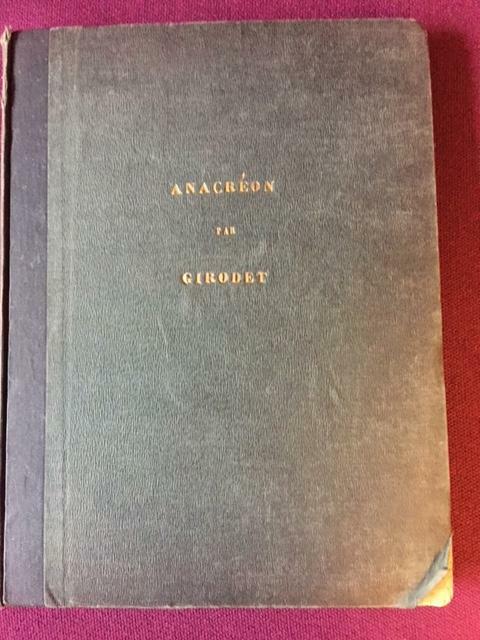 Anacreon. Recueil de compositions dessinees par Girodet et gravees par M. Chatillon, son eleve. Avec la traduction en prose des odes de ce poete faite egalement par Girodet. Publie par son heritier et parles soins de MM. Bequerel et P.-A. Coupin. Mit 48 (statt 54) Umrißkupfern. Harry and Lucy Concluded; being the last part of Early Lessons. La Festa delle Ombre Veline. Cantata [for solo voices, chorus, and orchestra] per festeggiare il giorno Onomastico di S:A:R: il Principe Ereditario del Regno delle due Sicilie. Poesia del Dottore Sigr. D. Basilio Iannicelli. Musical manuscript full score. 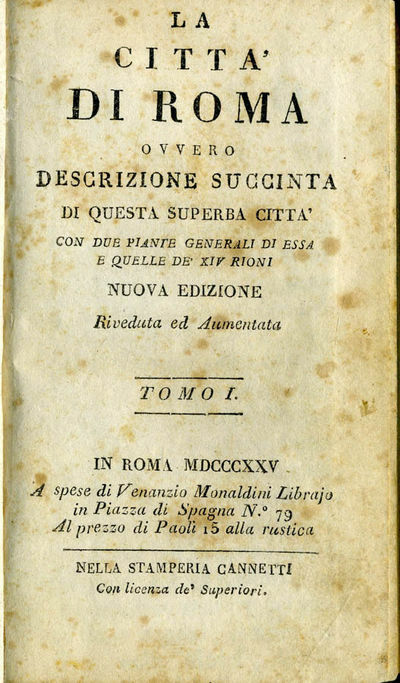 Marked "Originale" and dated "9 Aprile 1830" on title. Oblong quarto, 228 x 295 mm. Sewn in signatures. Watermark "D. Giovanni G" and fleur-de-lis within a double-lined circular frame. 212 pp. notated in ink on rastrum-ruled staves varying from 10 to 20 in number. The work consists of 9 numbers. The action takes place in the ruins of the ancient city of Velia, not far from Salerno, south of Naples. Named characters include Lucania, Palinoro, Melpina, Zenone, Otone, Roberto Sacerdote (the Priest), and chorus and orchestra. Some corrections and cancels. A copy of the libretto (presumably manuscript) is held at the Biblioteca dell'Archivio di Stato di Salerno, which attributes the music of the cantata to the lawyer, scientist, politician, and philosopher Pasquale Borrelli. We have not located any other sources, either printed or manuscript, of the work. Written to commemorate the name day of Queen Maria Isabella, second wife of King Francis I, King of the Two Sicilies, who reigned from 1825 to 1830. Maria Isabella was the daughter of King Charles IV of Spain. For a more extensive description of the work and setting, see Fiore: Il Teatro a Salereno nei secoli XVIII e XIX in Rassegna Storica Salernitana Year 5, January-July 1944, pp. 58-59. 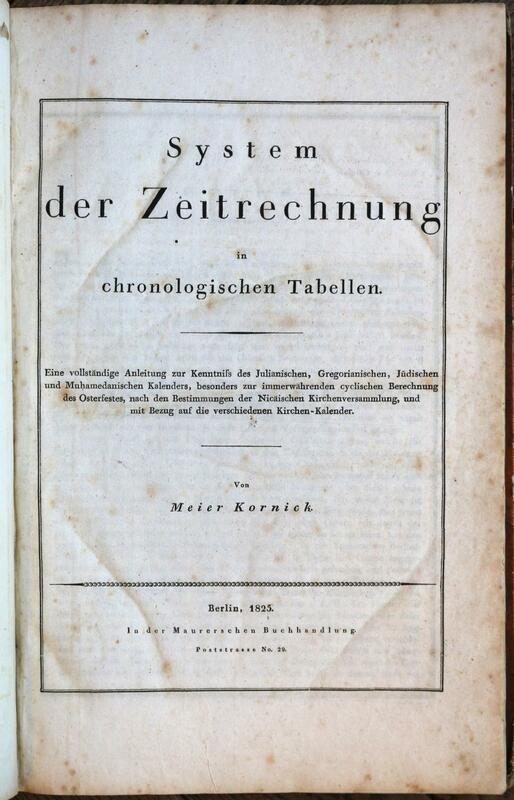 System der Zeitrechnung in chronologischen Tabellen. 1825. [still in the original boards] translated from the Kinder und Haus Marchen. From Oral Tradition. [In Two Volumes.] London: James Robins & Co. / Dublin: Joseph Robins Junr. & Co., 1825/1826. 10 pp preliminary ads in Vol I; 1 page terminal ads in Vol II. 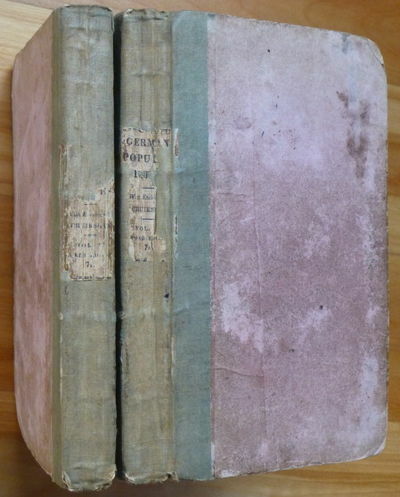 Original pink paper-covered boards with green cloth spines and printed spine labels, all page edges uncut. First Edition in English of Vol II, and second edition of Vol I -- which is how this pair of volumes is often found, since the 1823 first edition of Vol I "is a rarity eagerly sought after by collectors of early children's books" [Quayle, in 1971]. That 1823 first volume was by a different publisher and in a different binding, but here, both the 1825 Vol I and the 1826 Vol II are by the publisher and in the binding that is standard for Vol II. (This second edition of Vol I includes a ten-page Preface not in the first. )~The volumes contain such tales as "The Travelling [Bremen-Town] Musicians," "Hansel and Grettel," "Rumpel-stilts-kin" and "Tom Thumb." Jacob and Wilhelm Grimm, both professors of linguistics, collaborated in collecting these folk and fairy tales from the mouths of their country-folk; the tales had first been published in German in two volumes in 1812/1815. Included in these two volumes are engraved title pages plus nineteen (of twenty) plates by a young George Cruikshank.~As for condition, there is general wear to the edges of the boards and a little at the ends of the spines; about half of the Vol I spine label, and about a third of the Vol II spine label, have perished. There is occasional foxing, and the bottom half-inch of a rear free endpaper is torn away. Each half-title bears an 1828 inscription from father to son. It is amazing that these two volumes are still in their fragile paper-cover boards, more than 190 years after publication; the page edges are still uncut, as issued. Quayle CHILDREN'S pp 37-38. Housed in a cloth slipcase with leather label, with inner chemise. Libreria de F. Rosa, Paris, 1825. Very good: stain to rightmost inch of upper board, overall wear to spine with chipping to ends; stain to upper right corner of first 17 leaves (not affecting text or images), offset from plates. 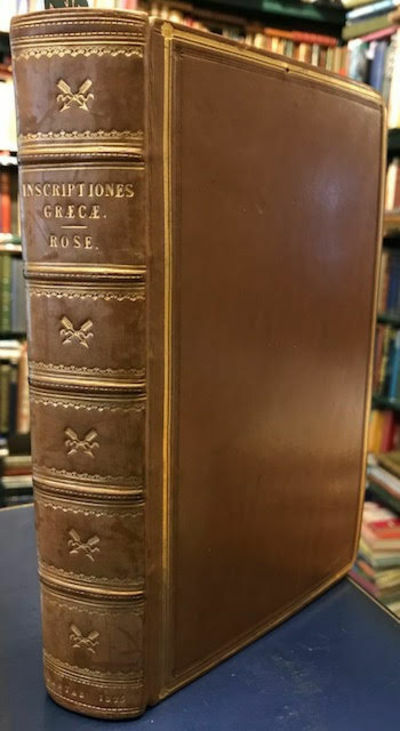 first Spanish Edition 6 1/2 x 9 1/2 inches, iv, 178 pages, contemporary marbled boards with sheep spine, Engraved frontispiece and title page (in Spanish), plus 30 engraved plates composed of 5 images each. Captions to the plates are in French. The title page also lists Madrid and Brussels as places of publication for this Paris-region imprint; the imprint on page 178 identifies E. Pochard of Paris as the printer, while the imprint on the verso of the title names Alex. Daumont of Versailles. The text and plates describe and illustrate, for young people, a broad range of industrial arts including winemaking, textile manufacture, woodworking, clockmaking, tobacco culture, papermaking, printing, bookbinding and bookselling. OCLC locates only the New York Public Library copy (having the engraved title in French) of this edition. The work first appeared in French, in 1822. A Practical Treatise on Rail-Roads, and Interior Communication in General; with Original Experiments, and Tables of the Comparative Value of Canals and Railroads. Illustrated by Engravings. London: Printed for Knight and Lacey, 1825.. [Railway History]. FIRST EDITION. Octavo (24 x 15cm), pp. ; 314. With five folding copper-engraved plates, including a frontispiece. Recently re-backed using original brown paper-covered boards, with a new brown paper-covered spine to style. Black titles to cream label on spine, with the date written by hand in black ink to base of spine. Plate of Newbury Reference Library to upper board, with shelf number written in black ink. All edges untrimmed. Complete with original publisher's adverts to prelims, with occasional light pencil marginalia. Wear to boards, especially fore-edges. Very good overall. Working closely with both George and Robert Stephenson, Wood was hugely influential in the development of early steam locomotives, having begun his career as a mining engineer in County Durham. This was his first book on the subject, which went on to be re-published in several new editions as his career developed over the following decades. Gesamtansicht, von Ludwigshafen über den Rhein, "Mannheim". Series of Twenty-One Original Pencil Drawings. Oblong folio. [c.1825-1830] 21 pencil drawings, on rectos only of 21 consecutive leaves in contemp. artists&apos; sketch book, roan spine & corners, 35 x 26cm; final few leaves with light damp stains in outer margin, occasional light spotting, tissue guards worn in places.A series of highly accomplished pencil drawings, mainly of rural and pastoral scenes, containing delicate studies of trees, churches, lakes and follies. Most are unsigned and undated, but three have the signature H.W. Burgess in the lower margin, and are dated 1827 and 1830. These are archetypal Burgess drawings, depicting idyllic scenes of outstanding natural beauty. In 1827 Burgess published a work entitled Eidodendron, which contained 54 plates: &apos;Views of the general character and appearance of trees foreign & indigenous as connected with picturesque scenery&apos;. 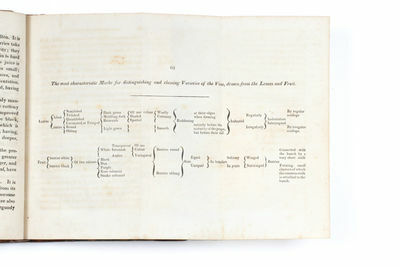 These sketches could be similarly titled, and may well have informed the artist&apos;s later publication Studies of Trees, published by J. Dickinson in 1837. 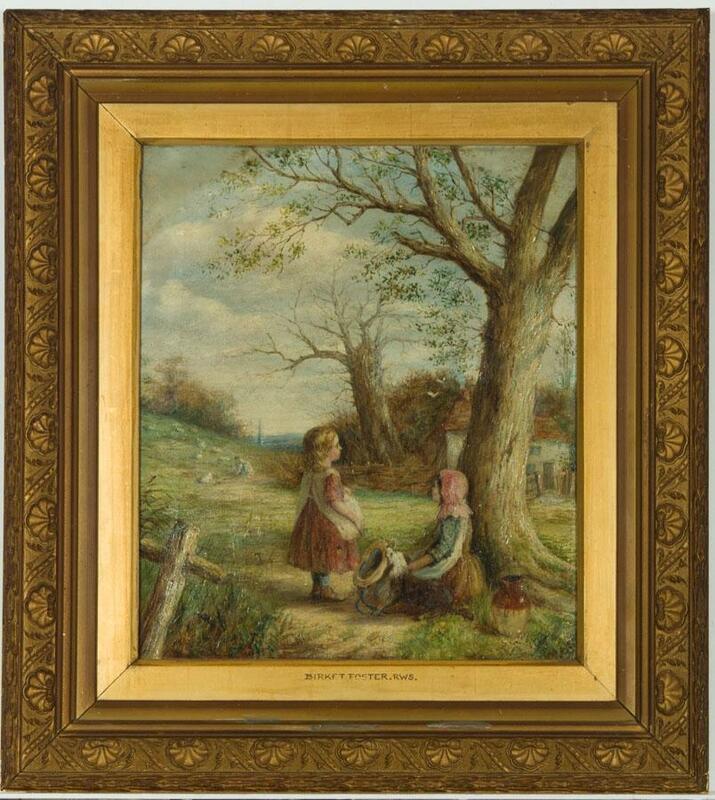 Burgess, c.1792-1839 (1844 in other places), was born in London into a family of well-known artists. He exhibited at the Royal Academy, and in 1826 became landscape painter to William IV. Oxford: Talboys and Wheeler; London: W. Pickering,, 1825. Life, poems and tales; Parliamentary debates. 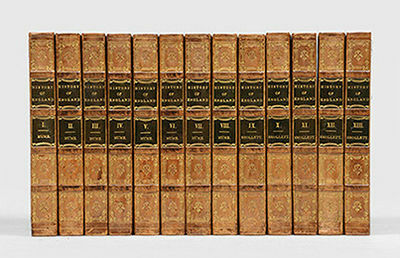 11 volumes, octavo (214 x 133 mm). Contemporary tan calf, light brown and dark brown labels to spines, spines and front covers stamped with arms of Trinity College Cambridge in gilt, marbled endpapers and edges, brown silk place markers. Bookplate of Joseph Henry Straker to pastedown of most volumes. Without the portrait frontispiece present in some issues of vols. I or III. Very light marking to covers, vol. X with slight wear to front cover, small sticker to front pastedowns, occasional very slight blemishes and foxing to contents. An excellent set. 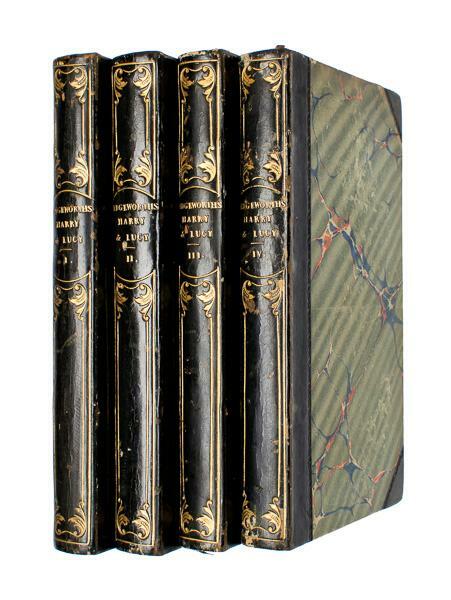 A handsomely bound set of Samuel Johnson's works, part of Pickering's Oxford English Classics series. The edition was superintended by Francis Pearson Walesby (17981858), professor of Anglo-Saxon in the University of Oxford. The work was initially intended as a nine volume series; a supplementary two volumes of Johnson's debates brought the total to eleven. Hardinsburg, Kentucky, 1825. Unbound. Very good. This three-page folded-letter measures 14.75" x 12.25" unfolded. Sent from Hardinsburg, Kentucky to Bedford, Virginia, dated March 14th, 1825. It has a manuscript "Hardingsburg Ky / Mar 15th" postmark with a "Paid 50" rate marking indicating that postage was paid for a delivery over 400 miles distant. The sender was charged double the single-letter rate because the folded-letter contained legal form (no longer present). The letter is in nice shape with some wear; splits beginning along some of the folds. Lots of docketing. In this letter that will make your skin crawl, Thomas Lowry emphatically encourages his brothers John, William, and Triptellto commit perjury in a pending lawsuit filed by a family slave, Sam. It had been their father's long-time intention that upon his death that Sam would be emancipated, and shortly before his death, he included this provision in a will and informed Sam. Upon his father's death, Thomas refused to grant Sam his freedom. Sam obtained legal counsel and filed suit against the estate. The letter reads in part, "Sam has brought suit for his freedom the grounds that he brings suit on is from a will that Farther maid a few months before he died In this will he set Sam free this will were maid onknoing to me as soon as I hurd I went and drew the will . . . and I thought it were all safe [but] Sam advised with the lawyers and thay advised him to bring suit . . . I want you to remember when Farther delivered Brother William his negroes that he delivered Sam to you and . . . said to you I want you to let Sam stay with me my lifetime . . . you agreed to do so . . . I want you to prove by Brother William and Triptell . . . that Sam was delivered to you when you were here. If you can't prove Sam ware your property the case will be very doubtfull . . . If you cant prove [that] you must come and take him in persession and you can prove by me he ware your property at the time the will ware maid. . . . The coarse Ile persew is to try and break the will on the account of farthers being out of his elements. I can prove by 4 or 5 withnesses that he ware out of his natural elements before and after he maid the will [but] Sam can prove . . . Farther ware in his perfect elements . . . William Scanton roat the will and Barryamen Lowry witness to the will and they both say they will sware that farther was in his proper elements at the that time. . . . My atterney says the main chance is to prove that he ware not Fathers property . . . I am yousing every creation within my powerss . . . Moorman is strong evidence against me he says he always herd father say he intended to free Sam at his death . . . You must without fail take the depositions [and] employ some good lawyer to . . . send them on as quick as possible." A unique example that not only documents the evil of slavery and one family's greed, but also testifies to the integrity of other white Southerners who were willing to fight in court to ensure Sam was manumitted. London: Printed for Knight and Lacey, 1825. [Railway History]. FIRST EDITION. Octavo (24 x 15cm), pp. ; 314. With five folding copper-engraved plates, including a frontispiece. Recently re-backed using original brown paper-covered boards, with a new brown paper-covered spine to style. Black titles to cream label on spine, with the date written by hand in black ink to base of spine. Plate of Newbury Reference Library to upper board, with shelf number written in black ink. All edges untrimmed.Complete with original publisher's adverts to prelims, with occasional light pencil marginalia. Wear to boards, especially fore-edges. Very good overall. 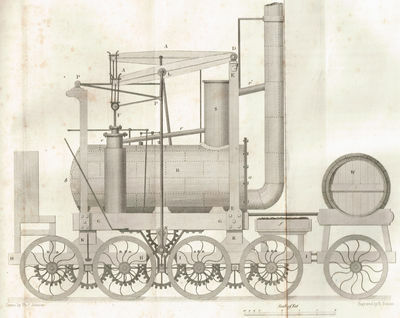 Working closely with both George and Robert Stephenson, Wood was hugely influential in the development of early steam locomotives, having begun his career as a mining engineer in County Durham. This was his first book on the subject, which went on to be re-published in several new editions as his career developed over the following decades. Hoff, von, K., E., A.
Geognostische Bemerkungen über Karlsbad. Mit vier Kupfertafeln, Auf Drey Blättern. The Works. Life, poems and tales; Parliamentary debates. Cantabrigiae: Typis ac Sumtibus Academicis Excudit Joannes Smith 1825. 8vo. lxxx, 428 pp. Full brown calf. Raised bands to spine with decorative gilt panels and gilt lettering. All edges marbled. Marbled endpapers. Spine slightly marked. Boards clean. Internally very clean. No ownership names. With 55 finely-printed plates of inscriptions, mainly folding, three printed in red & black. Text in Latin and Greek. Scarce. . Near Fine. Full Calf. 1825. GRUNDMANN. 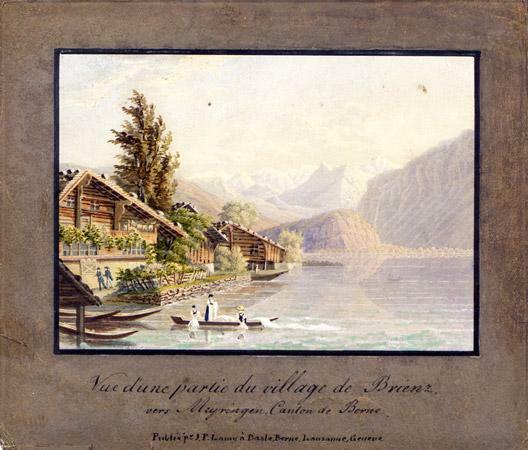 - LAMY, J. P.
Vue d?une partie du village de Brienz vers Meyringen, Canton de Berne. Bâle, J. P. Lamy, s.d., vers 1825, - 11 x 15.5 cm, aquatinte coloriée à la main (gouachée), encadrement au trait noir, sur papier gris/noir / Kolorierte Aquatinta mit guachiertem Blattrand, 1 feuille (18 x 20.5 cm). Passepartout. Please notify before visiting to see a book. Prices are excl. VAT/TVA (only Switzerland) & postage. London: Sherwood, Jones and Co, 1825. Enlarged Edition. Octavo; VG-/No jacket; Red spine with gilt lettering, raised bands and gilt designs; Original wraps re-bound in 3/4 red leather with marbled boards; Wearh and bumping to the edges, some fraying starting at the corners; Binding is tight; Deckled pages show age toning, a few spots, otherwise clean; Previous owner's bookplates on paste down; Full color plates and b&w plates intact. 583 pages with index and advertisements. SHELVE: case 1. Dupont. 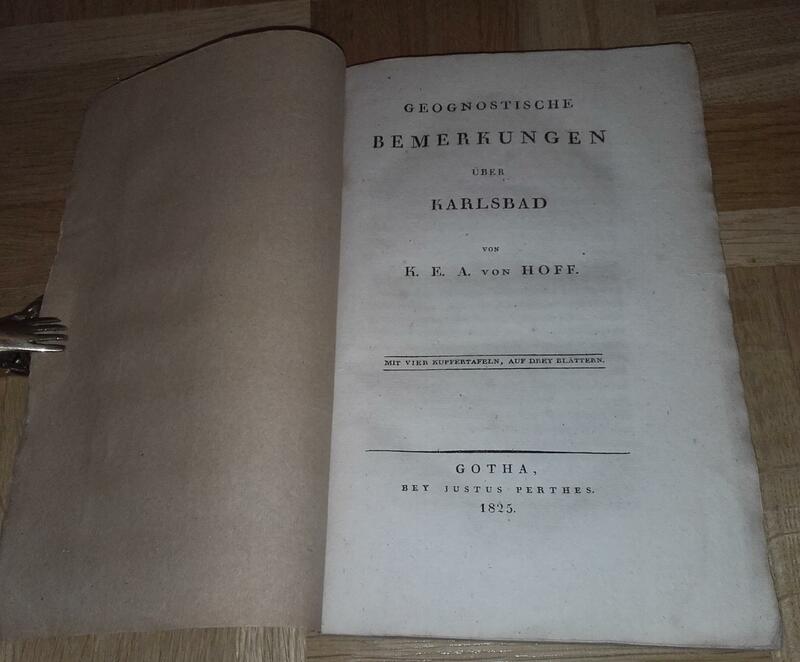 First published in 1823, this is the substantially enlarged 1825 edition. A nice addition to any collection related to American Indian or Mormon history. Very Good. London, Harvey and Darton, 55 Gracechurch Street, 1825 and 1817.. 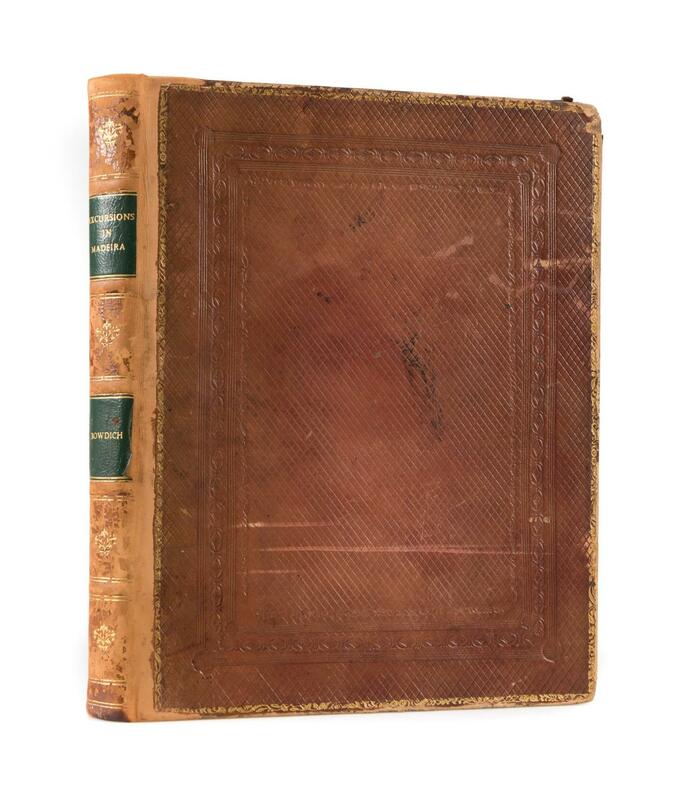 In two parts: the first a reprint of 1825 and the second a first of 1817, 12mo, 130 x 105 mm, 5 x 4 inches, half leather over marbled boards, gilt rules to spine, no lettering or label, pages: 56; 62, including 2 title pages and 2 Advertisements to the Reader. Word lists and many short passages for beginner readers. Title to Part 2 has this addition: "Restricted (with a few exceptions) to words of two syllables", and it contains some little stories. Some light age-browning to Part I, occasional slight pencil marks. A very good copy of an uncommon primer. The Dartons, page 57, No. G214, Part I not located by the author. No copies located in the UK except for the British Library which has only Part II, no others listed on WorldCat. No copies in Osborne, Oppenheimer Catalogue or Gumuchian. BOUND WITH 2 OTHER ITEMS: ANNE AND JANE; or, The Good Child's Reading-Book. 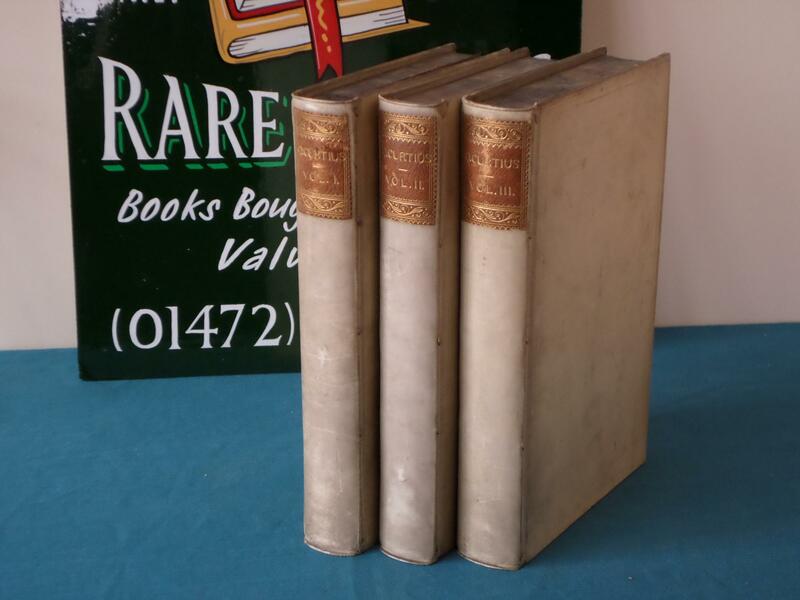 In Words of One Syllable, by Frances Bowyer Miller, Harvey and Darton, 1825, 47 pages but lacking pages 5-16, 4 pretty engraved plates. Previous owner's partial hand colouring to frontispiece, 3 minute worm tracks in lower margin of frontispiece, 40 mm (1¾") closed tear to 1 text page neatly repaired, no loss. Defective copy (lacking 6 leaves as noted) but a rare book. The Dartons, page 175, No. 636. 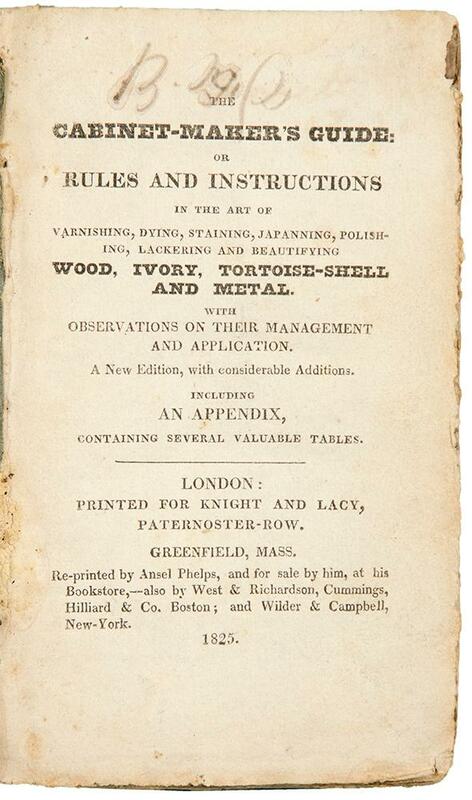 1 copy only on WorldCat, the British Library copy of 1832, not in Osborne, Oppenheimer Catalogue or Gumuchian. THE THIMBLE RESTORED; Or, The Idle Girl Converted To Habits Of Industry, by Elizabeth Richmond, Harvey and Darton, 1821 (? 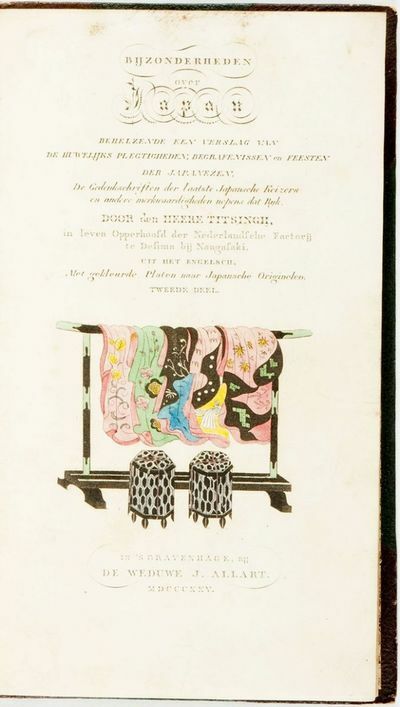 ), pages: 3-67, LACKING TITLE PAGE (A1), present are the frontispiece and 3 pretty engraved plates with decorative border, 1 shows child sewing with her mother and sister, another a child playing the piano for them, the third a girl falling to the ground from a swing, her 2 companions anxious, the last a little girl reading Goody Two Shoes to her mother in an elegant drawing room. The first 2 leaves repaired in the inner margins, no loss of text, frontispiece trimmed at lower edge with partial loss of imprint, quite neat partial hand colouring to all 4 plates, small pale damp stain to top inner corner of final plate and facing page. A good plus copy of a charming story which is rather rare (no title page as noted). 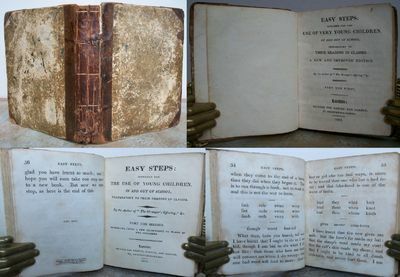 The Thimble Restored was first published by Darton and Harvey in 1821 and reprinted in 1825. Without the title page it cannot be dated with certainty. The Dartons, page 225, No. G808. 1 copy only located in the UK, in the British Library, WorldCat gives 3 locations in US libraries. Not in Osborne, Oppenheimer Catalogue or Gumuchian. The binding is worn and rubbed, upper hinge cracked, small crude repair to 1 cord, tail of spine chipped and with small vertical crack, similar crude repair, a little light scribble on front endpaper. MORE IMAGES ATTACHED TO THIS LISTING, ALL ZOOMABLE, FURTHER IMAGES ON REQUEST. POSTAGE AT COST. 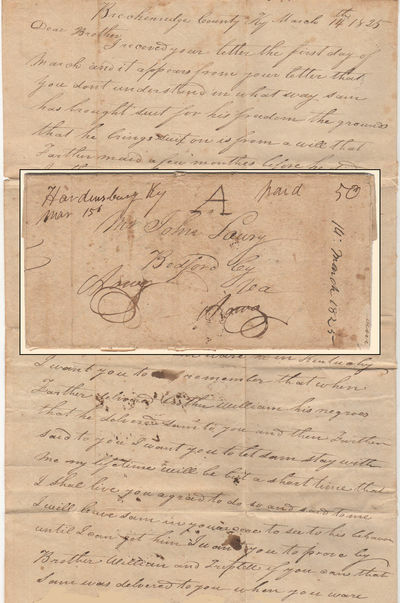 1825 - Autograph Letter Signed, to William Imlay, February 10, 1825. 1 p., 7&frac78; x 9 3/4 in. "The great struggle is over. no one, friend nor foe, expected a defeat, so sudden & signal. But we must submit like good citizens; I hope for better & brighter times. The Genl bears his disappointment, as he always bore his victories, like-a hero. "Congressman George Holcombe, a loyal Jacksonian, bemoans the loss of the election. New Jersey had given its one vote in the House of Representatives election to Jackson. Historical BackgroundFrom 1800 to 1820, the Democratic-Republican Party won six consecutive presidential elections. In 1824, the party split into factions that fielded four candidates: John Quincy Adams of Massachusetts; Andrew Jackson of Tennessee (the hero of the Battle of New Orleans); William H. Crawford of Georgia (former Secretary of War and Secretary of the Treasury); and Henry Clay of Kentucky (in his first of five unsuccessful presidential campaigns).In the election held between October 26 and December 2, 1824, Andrew Jackson received 41% of the popular vote and 99 electoral votes, while John Quincy Adams garnered 31% of the popular vote and 84 electoral votes. Crawford and Clay divided the remaining popular vote and together gained 78 electoral votes. John C. Calhoun was easily elected as Vice President with 182 electoral votes, more than twice the total of all other candidates combined.As no presidential candidate won a majority of electoral votes, the House of Representatives had to decide the outcome, based on the provisions of the Twelfth Amendment. In the original election, five states had divided their electoral votes, with New York apportioning votes among all four candidates. However, in the House, each state had only one vote, and could consider only the top three candidates-Jackson, Adams, and Crawford. The fourth candidate, Speaker of the House Henry Clay, detested Jackson and threw his support behind Adams, who won on the first ballot with thirteen states, to Jackson's seven, and Crawford's four.Jacksonians were shocked by the results. They accused Adams and Clay, who became Adams' Secretary of State, of a "corrupt bargain." 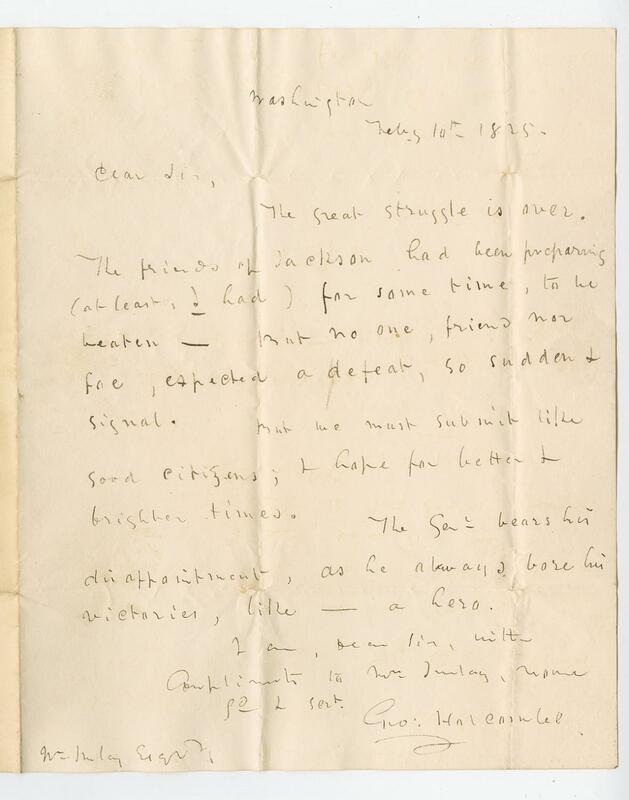 Jackson's supporters coalesced into the Democratic Party, while Adams and Clay founded the National Republican Party and then the Whig Party.Complete TranscriptWashington / Feby. 10th 1825.Dear sir, The great struggle is over. The friends of Jackson had been preparing (at least, I had) for some time, to be beaten. But no one, friend nor foe, expected a defeat, so sudden & signal. But we must submit like good citizens; I hope for better & brighter times.The Genl bears his disappointment, as he always bore his victories, like-a hero. I am, Dear Sir, with Compliments to Mrs Imlay, [your gd?] & sert.Geo: Holcombe.Wm Imlay Esqr[Address:] Geo: Holcombe William Imlay Esq / Allentown, / N.J.George Holcombe (1786-1828) was born in New Jersey and graduated from Princeton University in 1805. He studied medicine at the University of Pennsylvania and was a physician in Allentown, New Jersey, from 1808 to 1815. He served in the New Jersey General Assembly in 1815 and 1816, and in the U.S. House of Representatives from 1821-1828. Initially a Republican, he became a Jacksonian over that time.William Imlay (1790-1880) was a resident of Allentown, Monmouth County, New Jersey. He served as a justice of the peace in Monmouth County and as postmaster of Allentown (1820-1844). He also owned a drug and hardware store, and raised silk worms and mulberry trees. His cousin, James H. Imlay, had represented the district in Congress from 1797 to 1801. - A. Sautelet & Cie, Paris 1825, 12,5x20,5cm, relié. - Edizione originale pubblicato anonimo. Vincolante metà Havana pecora, indietro leviga decorato con reti dorati, tappi leggermente strofinato, piatti di carta marmorizzata con piccoli graffi e marginalmente sporcato, un piccolo graffio a margine del secondo piatto, guardie e contreplats di carta a mano, fette gialle contemporanea vincolante. Piacevole stato interiore quasi privo di lentiggini, il ritratto dell'autore vestito da donna è carente, come al solito, nella nostra copia. Questa è la prima opera di Prosper Mérimée. - [FRENCH VERSION FOLLOWS] Edition originale parue anonymement. Reliure en demi basane havane, dos lisse orné de filets dorés, coiffes légèrement frottées, plats de papier marbré comportant de petites épidermures et marginalement salis, un petit accroc en marge du second plat, gardes et contreplats de papier à la cuve, tranches jaunes, reliure de l'époque. Agréable état intérieur quasi exempt de rousseur, le portrait de l'auteur habillé en femme fait défaut, comme généralement, à notre exemplaire. Il s'agit du premier ouvrage de Prosper Mérimée. Albany: Packard & Van Benthuysen, 1825. FIRST EDITION. Written by the French emissary to the United States during the French Revolution, this is the first American work on aeronautics. 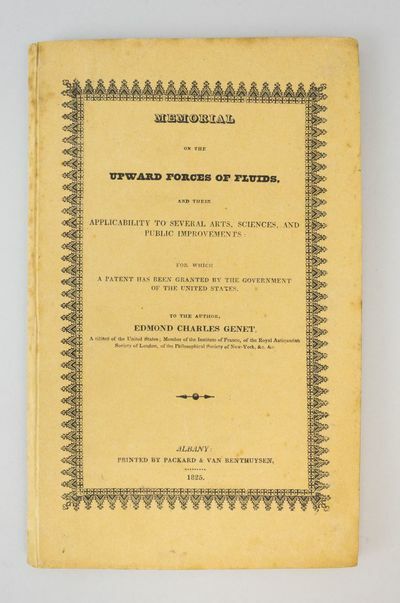 Streeter describes it as "extremely rare and important, the first book printed in the United States on practical aeronautics and on the first patent for an aeronautical invention," while Honeyman considers that "from a scientific viewpoint this is the most important American publication in the field of aviation, for it is the first printed suggestion of the correct theory of the heavier than air machine." A contemporary review in "The Boston Journal of Philosophy and the Arts" notes with amazement (and not a little derision) that Genet proposes "a monstrous balloon, which is to be loaded with a wind-mill and two horses, three men, their attendants, a chemical apparatus, an anchor, water, [and] provisions for the men." Impractical and fanciful, perhaps, but by such dreamers are others inspired. Within a century, Americans had mastered machine-powered flight by a heavier-than-air craft to such an extent that the airplanes could be used in waging war. Edmond Genet (1763-1834) went on to become a naturalized citizen of his host nation, and in a sad twist of fate, his great-grandson became the first official American casualty in World War I when his plane was shot down over France. The book is virtually always found noticeably foxed.. 230 x 140 mm. (9 x 5 1/2"). 112 pp. FIRST EDITION. Original printed beige paper boards. In a later brown buckram chemise. With five engraved plates, one folding table, and one illustration in the text. Howes G-100; Honeyman Catalogue 1475; Streeter 3974. Poor paper stock, so the text with not infrequent variable blotchy foxing as well as persistent (though minor) browning and offsetting, but the binding in fine, clean, appealing condition. Written by the French emissary to the United States during the French Revolution, this is the first American work on aeronautics. Streeter describes it as "extremely rare and important, the first book printed in the United States on practical aeronautics and on the first patent for an aeronautical invention," while Honeyman considers that "from a scientific viewpoint this is the most important American publication in the field of aviation, for it is the first printed suggestion of the correct theory of the heavier than air machine." A contemporary review in "The Boston Journal of Philosophy and the Arts" notes with amazement (and not a little derision) that Genet proposes "a monstrous balloon, which is to be loaded with a wind-mill and two horses, three men, their attendants, a chemical apparatus, an anchor, water, [and] provisions for the men." Impractical and fanciful, perhaps, but by such dreamers are others inspired. Within a century, Americans had mastered machine-powered flight by a heavier-than-air craft to such an extent that the airplanes could be used in waging war. Edmond Genet (1763-1834) went on to become a naturalized citizen of his host nation, and in a sad twist of fate, his great-grandson became the first official American casualty in World War I when his plane was shot down over France. The book is virtually always found noticeably foxed. 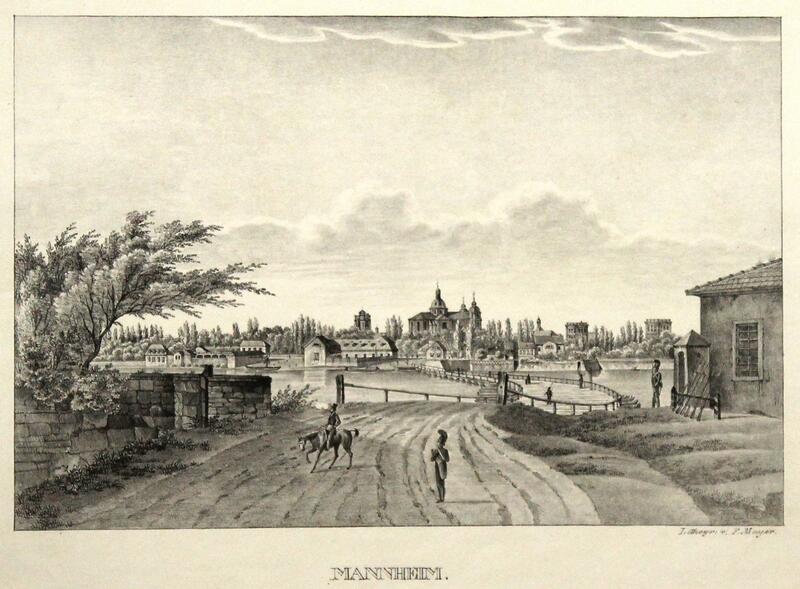 Netherlands: De Weduwe J. Allart, 1825. First;. This book is in DUTCH; volume II only; narrow octavo in dark green and brown cloth; Good+; spine in embossed, brown, thick cloth with gold gilt; binding strong; boards have moderate shelf wear, mostly around external edges and spine; tiny handwritten sticker on upper left inside cover; clean flaps illustrated in brown, flowery paper; front end pages discolored, with small stamps; back end page has penciled inscription; title page with original Japanese, colored illustration; thin paper slightly discolored with little foxing; text in fairly large print, clean; on pp. 192-3, beautiful folded original Japanese colored illustration of the earthquake and eruption of the mountain of fire Asama-yama; pp. 264; Case #6. Dupont. 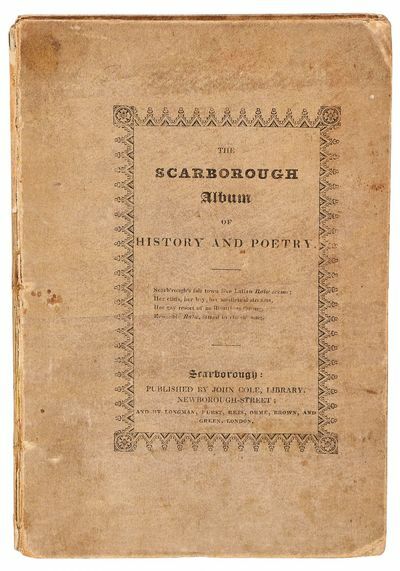 Scarborough: Published by John Cole, Library, New Borough Street; And by Longman, Hurst, Rees, Orme, Brown, & Green, London, 1825. Very Good. One of only two copies printed on white satin by the Scarborough antiquary and publisher, John Cole. Octavo. pp. [i-viii],  2-103 [104-131] 132-148 [149-150 (ads)]. 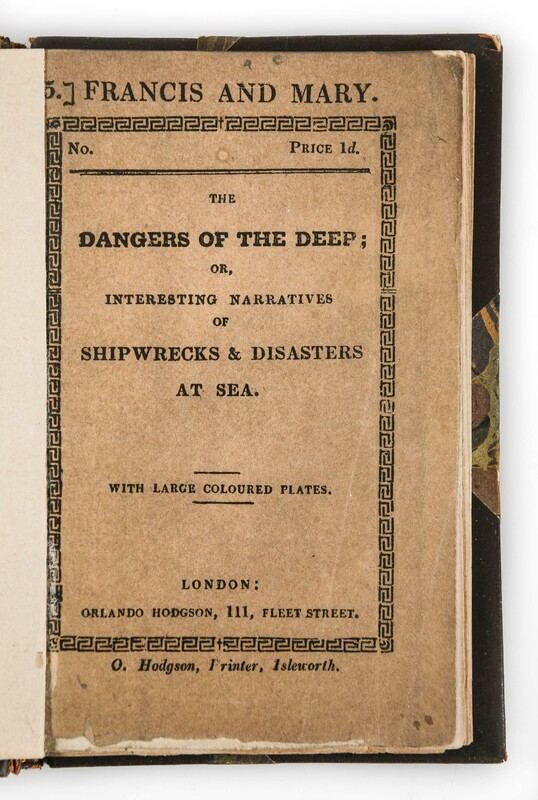 Illustrated with two full-page wood engravings printed on inserted leaves: the frontispiece: "Scarborough Cliff Bridge"; and facing p. 48: "Iron Chest, Found in the Palace Scarbro'". There are also four in-text wood engravings. A very rare example of a book printed in its entirety on silk, with a limitation statement written presumably in Cole's hand in ink on the front free endpaper: "Only 2 Copies of this work printed on white Satin, & 2 on pink satin." Bound in printed silk over boards (printed on the front, spine, and back cover). The cloth is rubbed with some soiling and loss to backstrip, foxing to the endpapears, very good. Engraved armorial bookplate of John Rhodes ("ung Durant Ma Vie") on the front pastedown, and two small early ownership signatures on the front free endpaper (in ink and in pencil). Laid-in is a printed business card: "The South Cliff Hair Cutting and Shampooing Saloons" with a wood-engraved view of Sarborough. Although printing on silk has always been uncommon because of the technical challenges involved, it enjoyed a brief vogue during the first quarter of the nineteenth century with the advent of white-line wood engraving. Entire books printed on satin are rarely encountered. A fine example.